When Lise Santos stumbles into a bakery’s midnight taste test, she meets the boy of her dreams. He’s as sweet as the macarons they share, and Lise is totally smitten. She’s pretty sure he is, too—but they never get the chance to exchange names. Lise has to find her mystery guy again, but when she does, he’s not anything like she expected. She’s determined to find out what he’s really like before she reveals who she is, and she enlists her friend Viv to help. But when Viv starts flirting with the boy Lise may or may not be falling for, things get complicated. Now Lise’s head and heart are in a jumble. Can she gather the courage to admit her true feelings…or is this a recipe for total disaster? A kiss, I thought deliriously as I closed my eyes. I held my breath, waiting for his soft lips to brush mine. My first kiss . . .
“Espera aí! Hold it right there!” a stern voice bellowed in my ear, and I jumped as a hand clamped down on my shoulder. “But Dad . . .” I glanced back toward the awning of Swoonful of Sugar, where the potential boy of my dreams was standing in a state of confusion. Clunk! The door slammed shut, and a second later, Dad peeled away like a NASCAR driver with a serious case of road rage. All I could do was helplessly stare through the rear window as my first-ever Valentine disappeared from sight. 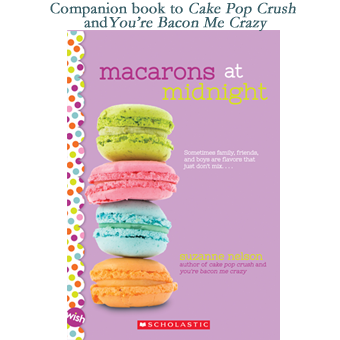 Macarons at Midnight is a Companion Book to Cake Pop Crush and You’re Bacon Me Crazy. Available for purchase in bookstores and online!